Most of my favorite films are genre offerings that push the boundaries of an established genre close to the breaking point and occasionally even break the hell out of it. They often don't satisfy viewers looking for specific stylistic elements and bear the critical and financial brunt of their wrath. Ang Lee’s ‘Hulk’ (2003) is easily my favorite version of the Hulk on film. ‘Godzilla vs. The Smog Monster’ (1971) is my favorite Godzilla film. I like them because they take these kinds of films, with their familiar and established tropes, to a place where they become something which is and isn't the genre in which it's been presented. 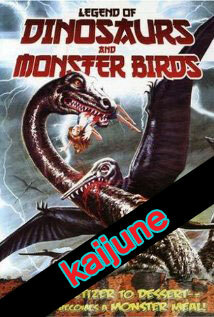 ‘Legend of Dinosaurs and Monster Birds’ manages to be an, eco-horror film, a ‘Jaws’ (1975) rip-off, and a kaiju film all at once, and yet at the same time manages to become none of those things. LoDaMB starts with a young woman wandering through the woods. She leaves her shoes behind and her vision is very blurry. It's a little vague on whether this is due to chemicals she's ingested or the movie is just being weird. It doesn’t help that as things go on, you the viewer, will also feel like you're tripping balls. Either way, she falls down a hole into a cave filled with ice and big eggs. One of the eggs begins to hatch and the young woman is attacked. Cue, a money hungry geologist, Ashizawa (Tsunehiko Watase), who decides to go looking for the eggs somewhere around Mt. Fuji. He meets an old flame, Akiko (Nobiko Sawa), who happens to be doing some underwater photography in the area. There is also a ‘Dragon Festival’ to celebrate the legend of a red-eyed dragon that lives in nearby Lake Sai. Sadly for everyone and fortunately for us, environmental changes have caused a plesiosaur and a rhamphorhyncus to awaken and start eating the populace. LoDaMB takes a lot of its cues from Jaws, such as the festival, and the officials who are reluctant to close the beach. It even goes so far as to recreate entire scenes. It also taps into environmental horror that was popular at the time, the notion that Mother Earth was having her revenge. Strangely it never fingers a particular source of environmental harm that is causing the problem. It’s also a kaiju movie that avoids having its monsters destroy a lot of property and instead lingers on them cruelly playing with their prey and graphically devouring it. The hero isn’t very heroic; the heroine is a screaming mess. The question of their survival at the end is left maddeningly vauge. The film is shot in formal compositions against brilliant color with high contrast blacks. It’s quite beautiful and has the effect of giving the cave scenes and fog shrouded lake an almost dream like quality. The miniature work is excellent. The dinosaurs both have a great menace to them, lessened a bit by some ill chosen sped up sequences during the final fight. The score is beyond bizarre, substituting the usual bombastic orchestra and fuzz guitar of most kaiju films for super funky disco and easy listening sounds. This comes across especially disconcerting during monster attacks and huge cataclysmic earthquakes. Not a popular movie amongst kaiju purists and a bit too silly for someone looking for some straight-up 70’s style horror. None the less I find it a strange surreal film packed with so many curious moments that it makes for a very compelling experience.